Worldwide server revenue has recorded 16 per cent growth in what is the second consecutive quarter of growth in the market. According to research and analyst firm, Gartner, the third quarter of 2017 saw worldwide server revenue reach US$14.7 billion, or 16 per cent compared to the same period in 2016, which recorded US$12.7 billion. The previous quarter had also registered positive but shy growth of 2.8 per cent according to data from Gartner. However, the first quarter of 2017 saw a negative start with revenues down by 4.5 per cent, going from US$13.1 billion down to US$12.5 billion. "The third quarter of 2017 produced continued growth on a global level with varying regional results," Gartner research vice president, Jeffrey Hewitt, said. "A build-out of infrastructure to support cloud and hybrid-cloud implementations was the main driver for growth in the server market for the period." Shipments have followed the trend with 5.1 per cent increase in the third quarter of 2017. "x86 servers increased 5.3 per cent in shipments for the year and 16.7 per cent in revenue in the third quarter of 2017," Hewitt said. "RISC/Itanium Unix servers declined globally, down 23.5 percent in shipments and 18.3 percent in vendor revenue compared with the same quarter last year." 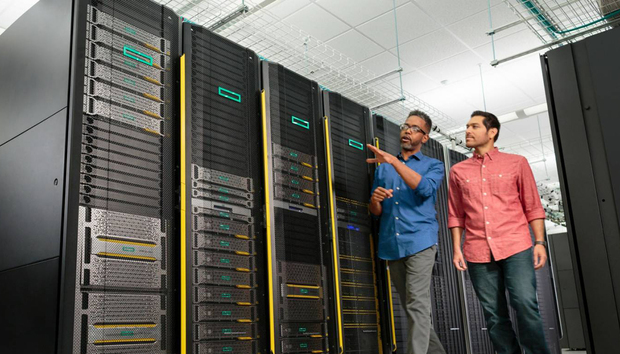 Hewlett Packard Enterprise (HPE) continued to lead the worldwide server market, based on revenue. Despite a decline of 3.2 per cent, the company posted $3.1 billion in revenue for a total share of 21 per cent for the third quarter of 2017. Dell EMC maintained the number two position with 37.9 per cent growth and 20.8 per cent market share. Inspur Electronics experienced the highest growth in the quarter with 116.6 per cent, driven by ongoing sales into China-based cloud providers, as well as global expansion efforts. In server shipments, Dell EMC maintained the top position in the third quarter of 2017 with 17.8 per cent market share, while HPE secured the second spot with 16.4 per cent of the market. Inspur Electronics was the only vendor in the top five to experience positive growth in the quarter.